With great sadness we note the untimely passing of D.M. Murdock (a.k.a. Acharya S). She died on Christmas day, having succumbed to breast cancer. Over the years we’ve had our differences with Murdock’s ideas (and her followers) here on Vridar, but we always respected her energy and tenacity. In the United States, unfortunately, illnesses like cancer can leave the living with large medical and burial bills. If you would like to help Acharya’s survivors, you can donate to a GiveForward fund set up in her name. No railway lines in West Bank and Gaza so trucks replaced trolleys in the narratives. 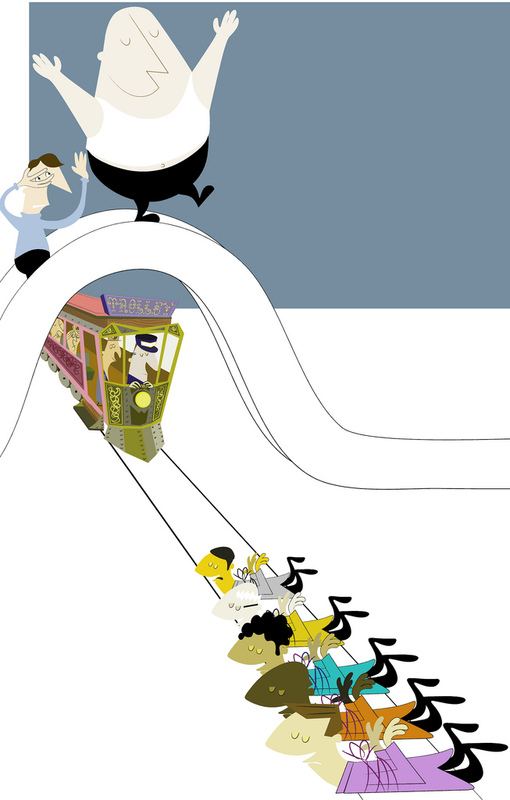 Speaking of the Devil or his doppelgänger, God, in my slightly flippant recent “trolley dilemma” post, what should appear in the serious social science research literature but that very trolley problem applied to Palestinian Muslims and Allah. God usually gets a bad rap among us atheists but fair’s fair so when the research tips in favour of the Ineffable One integrity demands we duly acknowledge it. Our findings cast doubt on the notion that there is something special about religious faith, including Islamic belief, that invariably favors promotion of violent intergroup conflict. Religious belief is often seen as a key cause of human conflict because it is said to promote preferential treatment of adherents and to harden group boundaries. Here, we examined a critical aspect of this link in the context of the Israeli–Palestinian conflict, a multigenerational violent conflict with significant religious aspects. We find that although Muslim Palestinian participants valued Palestinian over Jewish Israeli lives when making difficult moral choices, they believed that Allah preferred them to make moral decisions that valued the lives of Palestinians and Jewish Israelis more equally. Beliefs about God may promote more equal valuation of human life regardless of religious identity, encouraging application of universal moral rules to believers and nonbelievers alike. Religious belief is often thought to motivate violence because it is said to promote norms that encourage tribalism and the devaluing of the lives of nonbelievers. If true, this should be visible in the multigenerational violent conflict between Palestinians and Israelis which is marked by a religious divide. We conducted experiments with a representative sample of Muslim Palestinian youth (n = 555), examining whether thinking from the perspective of Allah (God), who is the ultimate arbitrator of religious belief, changes the relative value of Jewish Israelis’ lives (compared with Palestinian lives). Participants were presented with variants of the classic “trolley dilemma,” in the form of stories where a man can be killed to save the lives of five children who were either Jewish Israeli or Palestinian. They responded from their own perspective and from the perspective of Allah. We find that whereas a large proportion of participants were more likely to endorse saving Palestinian children than saving Jewish Israeli children, this proportion decreased when thinking from the perspective of Allah. This finding raises the possibility that beliefs about God can mitigate bias against other groups and reduce barriers to peace. Ouch! Possible that religion can be a force for peace? Well, “religion” is a loaded term. That’s not quite what the study is addressing. So here are some details. . . .